Posted on 14, March 2018 by EuropaWire PR Editors | This entry was posted in Automotive, Sweden, Technology, Transportation & Logistics, Travel and tagged bus, coach, Deji Wright, Fredrik Morsing, Hans-Åke Danielsson, Marcopolo, Scania, sustainable transport, Transport Services Ltd. Bookmark the permalink. Södertälje, Sweden, 14-Mar-2018 — /EuropaWire/ — Scania, in collaboration with the Brazilian bus and coach bodybuilder Marcopolo, will deliver 250 buses to the Nigerian city of Lagos. The buses will be delivered during the first half of 2018 and have been ordered by the company Transport Services Ltd (TSL), which will also be responsible for service and maintenance of the bus fleet. “The choice of Scania and Marcopolo as suppliers is in line with our strategy of becoming a leading player within public transport in Nigeria. The companies supply robust and passenger-friendly buses with favourable operating costs,” says TSL’s CEO Deji Wright. In Nigeria, like in other West African countries, an improvement and modernisation of public transport systems is underway, representing a great business opportunity for Scania. “Our strategy for meeting the strong increase in demand is to form partnerships with large cities in the region and offer modern and sustainable transport solutions,” says Fredrik Morsing, MD for Scania West Africa. 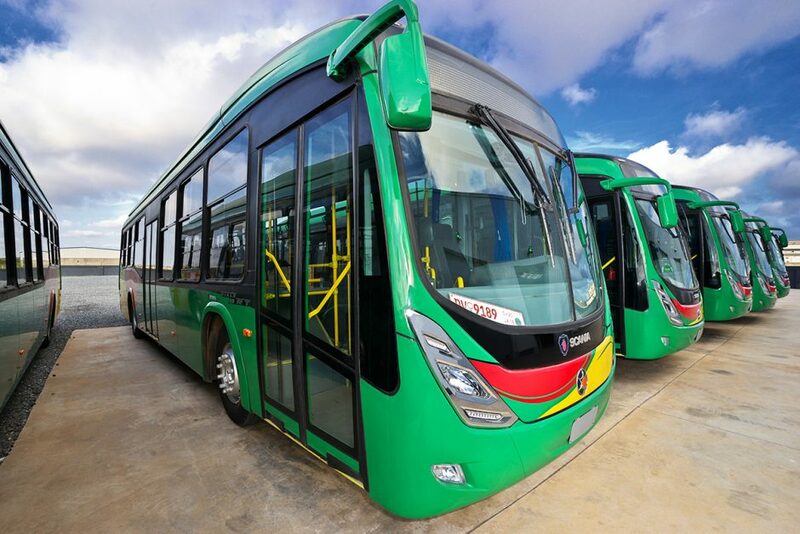 The buses that will enter into service in Lagos are to be delivered by Marcopolo. The 250 Scania buses will be built on Scania’s 2-axle low-entry chassis featuring a 9-litre 250 hp engine (K250UB4X2) and will be fitted out with Marcopolo’s Viale bus body model. This combination will mean buses with very good operating economy, high passenger capacity and comfort including easy boarding. In addition to the 250 Scania buses, Marcopolo will deliver 50 buses of its smaller Volare model, built on a Volkswagen Caminhões e Ônibus chassis (Volksbus 10.150OD). Scania’s efforts to boost its presence in the West Africa region began with the establishment in Ghana, where the company has delivered a total of about 400 buses and coaches since 2014. Aside from taking responsibility for servicing and maintenance of the buses and coaches, Scania has contributed to the design of bus service systems and training of drivers. Scania is a world-leading provider of transport solutions. Together with our partners and customers we are driving the shift towards a sustainable transport system. In 2016, we delivered 73,100 trucks, 8,300 buses as well as 7,800 industrial and marine engines to our customers. Net sales totalled nearly SEK 104 billion, of which about 20 percent were services-related. Founded in 1891, Scania now operates in more than 100 countries and employs some 46,000 people. Research and development are concentrated in Sweden, with branches in Brazil and India. Production takes place in Europe, Latin America and Asia, with regional production centres in Africa, Asia and Eurasia. Scania is part of Volkswagen Truck & Bus GmbH. For more information visit: www.scania.com.